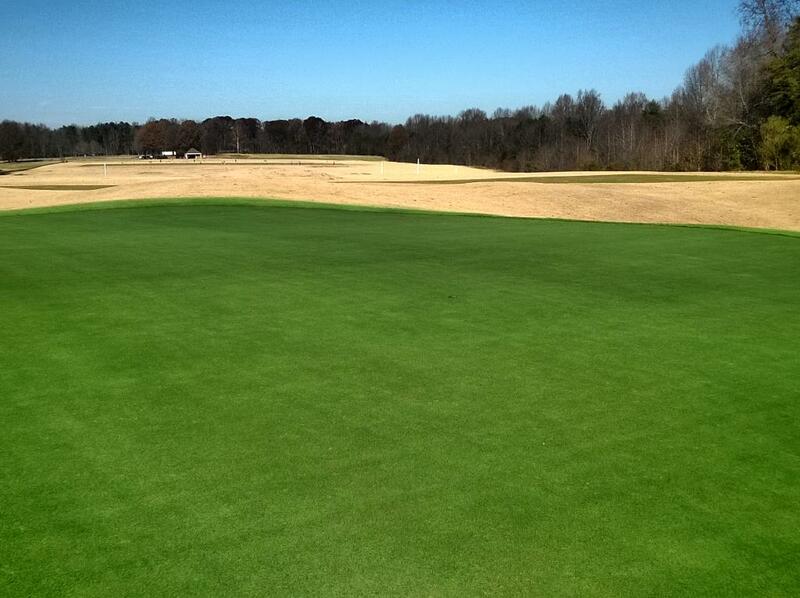 Endurant has a full line of turfgrass colorants to match the most popular turfgrass species. Endurant PR is perennial rye grass colorant to provide the color of the vibrant and popular bright green of perennial rye. Wow! That’s Endurant PR giving golf course superintendent Kevin Smith a rich perennial rye look. Due to completely dormant existing turf, Smith chose to apply at a higher than average rate. 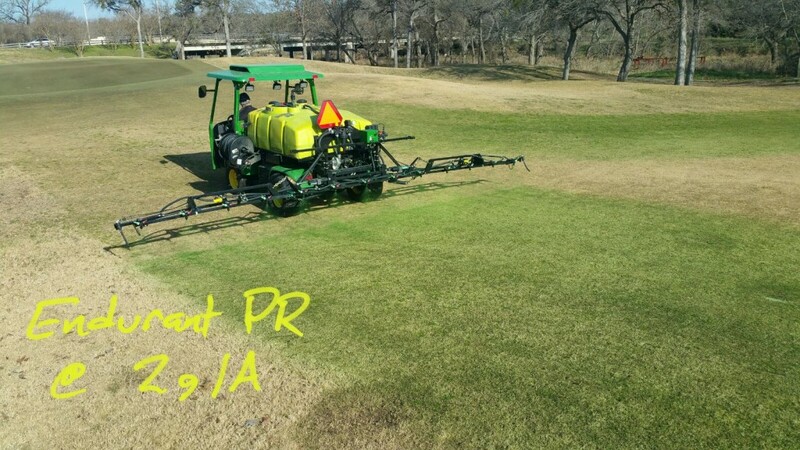 Endurant PR is often applied to fairways at rates between 6 and 10 gallons per acre. Endurant PR is recommended to be applied on greens at rates of 2 to 5 gallons per acre. Choosing the application rate is as important as choosing the shade of green. So once you know it’s perennial rye grass colorant that you desire, now you need to select the best application rate. Application rates vary based on many factors including the current shade of grass, current depth of color and desired depth of color. Dormant grass that is completely brown due to drought or dormancy might do better with a higher application rate while grass that is still producing chlorophyl through photosynthesis will have more green color in the grass blade already and may require lower application rates. Endurant PR’s recommended application rates for fairways range from 6 to 10 gallons per acre. Endurant PR is recommended to be applied on greens at rates of 2 to 5 gallons per acre. Below you see the results of a lower application rate providing a lighter green compared with the higher application rate that provides a brighter green. The colorant is the same and both are applied to dormant turf, but the resulting color depth creates a very different effect based on the application rate. 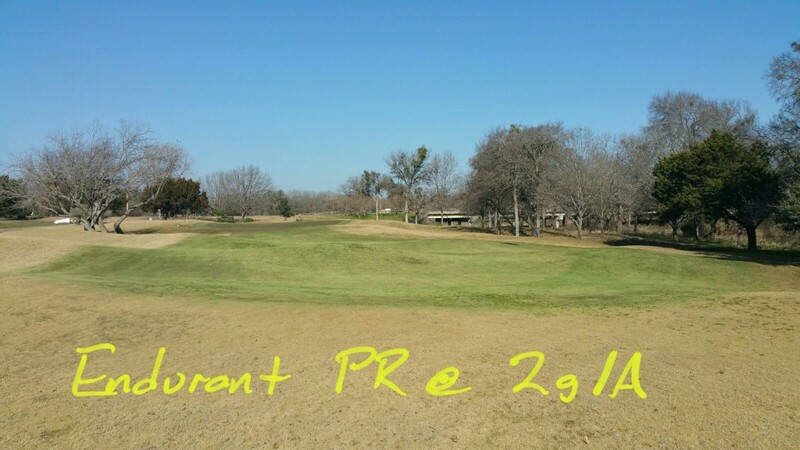 Here is a look at Endurant PR perennial rye grass colorant applied at a lower than average application rate at Legacy Hills golf course in Georgetown, TX. Endurant PR, Perennial Rye Grass Colorant, was applied at a rate of 2 gallons per acre to give the look of lighter perennial rye grass. 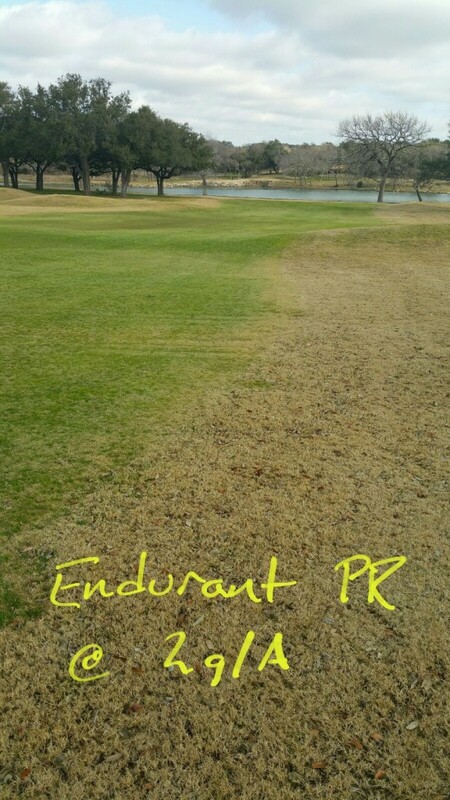 Endurant PR provides the brighter green of perennial rye grass. Here Endurant PR is applied on dormant brown turf at the Legacy Hills golf course in Georgetown, located near Austin, TX this winter. Two gallons per acre is low in the range of recommended application rates. 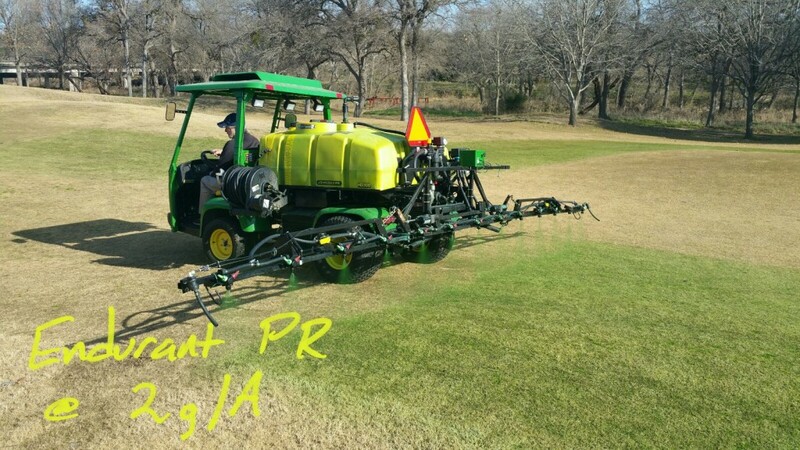 Endurant PR applied at the rate of 2 gallons per acre on dormant winter turf at Legacy Hills golf course in Georgetown, TX near Austin, TX. Endurant PR applied at the rate of 2 gallons per acre on dormant turfgrass brings the course back to life and provides appreciated contrast for players on the golf course. Endurant PR on dormant turf applied at the rate of 2 gallons per acre brings this dormant brown grass back to life with green color until springtime growth resumes.